Sausage makes a flavourful addition to almost any seafood recipe. 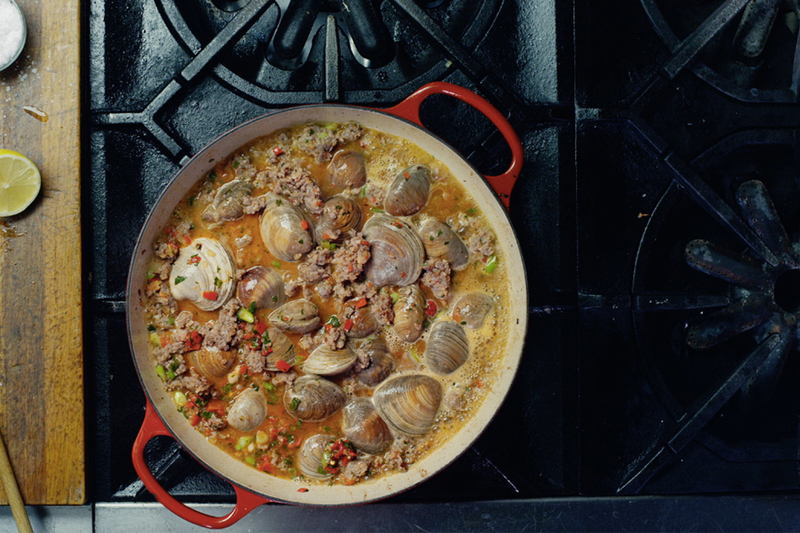 With this recipe, celebrity chef Mark McEwan has combined the savoury taste of steamed clams with the robust flavour of mild Italian sausage for an unbeatable combination. For Fish Stock: Combine white fish bones, 1/2 Spanish onion, 1 leek, 16 parsley stems, 3 bay leaves, 12 peppercorns, 1 lemon, 1 cup white wine and 2 tbsp kosher salt in a heavy-bottomed stockpot (not aluminum). Add 2 quarts of cold water, bring to boil, and then simmer for an hour or so, skimming scum from the surface as it rises.